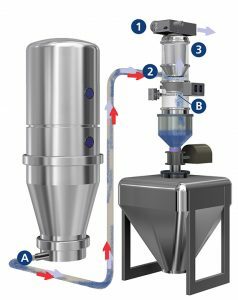 Volkmann vacuum conveyors transport fine food powders, chemicals, granules, pellets, tablets and other small components in lean, dense or plug flow conditions avoiding segregation, damage or abrasion of the product. This pneumatic conveying occurs via suction air stream under vacuum through hoses or pipes. Even if leakage were to occur, the vacuum prevents product from escaping into the environment. The following, and accompanying graphic, detail how this is accomplished. A) Material loading position– All materials can be aspirated directly out of/from production- and process machines, bins, bags, containers etc. C) Material discharging position– The transported material is loaded in cycles from the top into bin or process machine, e.g. into blenders, presses, bins, filling- and packaging machines etc. The vacuum pump (1) generates a vacuum in the Vacuum Conveyor’s separator tank. Air rushes in through the hose/pipe and the suction inlet (2) from the feeding point (A). The bulk material is aspirated and then carried in this air stream. Due to the special design of the separator tank, the velocity is reduced and the material is collected gently above the vacuum conveyor’s discharge valve. Inside the separator tank a filter module (3) separates airborne dust and product from the conveying air. The transported material is collected in the separator. When transporting fine dust, a cyclone element is inserted into the separator to provide higher transportation capacities resulting from a lower load of the filter elements. 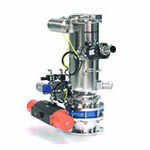 When the separator is filled with product, the vacuum pump switches off. Inside the vacuum conveyor the pressure is balanced to equal that of the surrounding area within tenths of a second. The separated material discharges from the vacuum conveyor through the discharge element and falls directly into the unit or tank to be loaded (B). While discharging product, the filter module is cleaned automatically by an air shock system. The occasional filter cake is released from the filter unit. Volkmann offers piston vibrators and fluidizing units to improve the discharging for sticky materials or those with poor flowing characteristics. After unloading the product, the discharge valve closes and the complete conveying cycle repeats.